You don’t have to venture outside of Putnam County to fill fall weekends with fun. But that didn’t stop me from making plans to visit Sparta last Saturday for the 16th annual “Lester Flatt Celebration” on Liberty Square. It was billed as a day filled with bluegrass music, food, crafts, a classic car show and—after dark—a fireworks display. Last year, the celebration was named the International Bluegrass Music Association’s Event of the Year. That was enough to convince me to make the short drive to White County on a breathtakingly beautiful autumn afternoon. And up through the ground come a bubblin’ crude. If you’re of a certain age, you’ll no doubt add Oil, that is. Black gold. Texas tea. Then you’ll sing the rest of the ballad. It’s still my favorite TV theme song of all time. And if you really want to see Flatt and Scruggs hitting their stride, go to You Tube and watch them sing “Pearl! Pearl! Pearl!” on Season 1, Episode 20 of “The Beverly Hillbillies.” You won’t be sorry. Though Lester Flatt wasn’t actually a native of White County, Sparta counts him as one of their own. 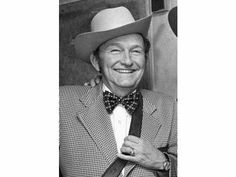 Born in 1914 in Overton County, Flatt moved to Sparta at a young age. Showing immense musical talent early on, he abandoned the banjo at age seven in favor of the guitar. As a young man, Flatt worked in textile mills, saw mills and a shirt factory. But bluegrass music was calling his name. He debuted on the radio in 1939 and the rest, as they say, is history. Sparta has honored Flatt, who died in 1979, with an historical marker, a bronze bust on display in the White County museum and a brass marker in front of the courthouse. His modest brick house, located on Lester Flatt Road not far from the country club, still stands. He and wife Gladys, who died in 2014 at the age of 98, are buried in Oaklawn Cemetery, just a couple of miles west of Sparta on Highway 70. Obviously, Lester Flatt is a really big deal in Sparta. Why wouldn’t I head down there for the big celebration? Only one reason. U.T. was playing Texas A&M smack-dab in the middle of Saturday afternoon. Recording the game wasn’t an option. Anyone with a smart phone and Facebook knows a football score can’t be kept a secret. What to do? What to do? I came up with a plan that turned out to be not at all satisfying. I watched the first quarter of the game on TV at home, just to get a sense of how the Aggies’ stadium looked and which uniforms each team was wearing and all that other important stuff. Then I scrambled into my car, found the game on the radio and listened to the second quarter on the way to Sparta. At halftime, I wandered around visiting vendor booths and listening to the music. I got back in the car to listen to the second half of the game, rolling down the windows during commercials for more live bluegrass and the fireworks show. A horribly imperfect way to celebrate Lester Flatt. Especially since the Vols lost in double overtime.